I am in Helsinki, Finland, for a few days this week, sitting on a review panel for the ‘Joint Programme – Neurodegenerative Disease Research.’ It is the first time that this programme has involved patients in its review process for funding research so it feels a bit of a milestone moment. This, after twelve months, of patients and the public coming together (lead ably by Mogens Horder in Denmark) to help develop an approach to public involvement that is practical, constructive and manageable for all concerned. Another small step for public involvement you might say. The meeting is taking place in the Helsinki Congress Paasitorni which, roughly translated, is the City’s Workers’ Hall. It is a rather magnificent building and last night I posted some of the art that adorns its walls, to my Instagram account. 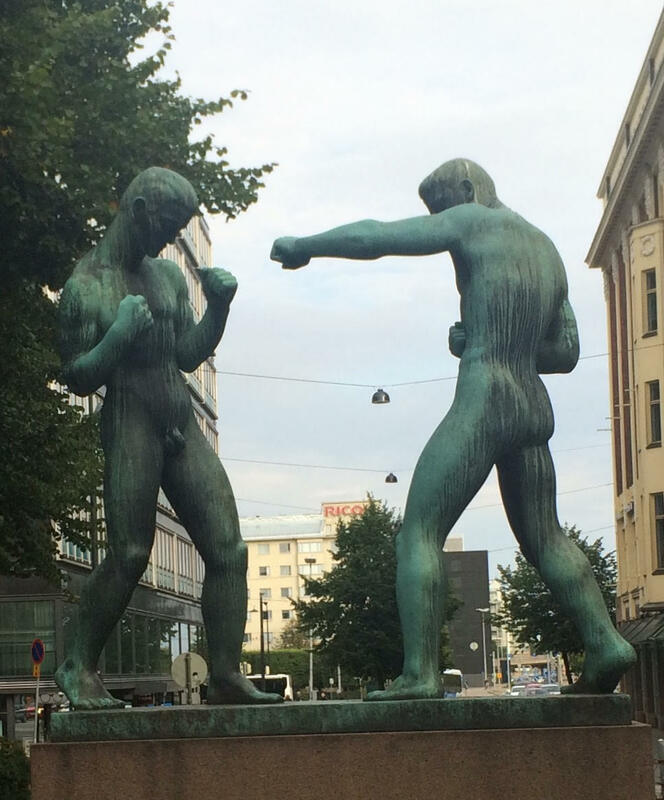 Outside, in the square, is a sculpture of two sparring fighters as see here. They certainly don’t seem that hostile towards one another do they? Somehow it feels like a fitting metaphor for how patients and researchers should be working together in a review panel: sparring together to get better, challenging each other’s thinking, endeavouring to develop each other’s technique . This is no bout between hostile combatants. Or it shouldn’t be. Yet, as well all know, what happens in the ring is dependent on many factors. From the quality of the referee (Chair) to how the ring is set up. I am happy to report that this has been a good experience thus far. Before I go….A good friend got in touch with me last week. ‘Have your ears been burning?’ they asked. Before going on to tell me how my name had cropped up in conversation with a mutual acquaintance. The saying – ”Have your ears been burning?’ – goes back to Roman times I understand. It was believed that if your left ear burns, someone is speaking ill of you and; if your right ear burns someone is praising you. But I am thinking we ought to update this bit of ancient lore to suit modern times. Something along the lines of: if your right ear burns then someone is accessing your personal data for societal benefit; if your left ear burns someone is using it unwisely. And if your nose itches then someone else is looking at your genome sequence. Why? Because of late I have found myself reviewing a lot research proposals in which, almost without exception, researchers are proposing the collection of this or that sample, to generate data that might be linked or not linked with other data, to give new insights or not into this or that disease. None of this is wrong or unethical of course. Appropriate consent has been sought from the patient in every case. Much of the proposed research could be highly significant in the search for disease causes and viable treatments. In fact it is perhaps one of the less talked about practical benefits of research using personal data that: if people were being poked, prodded and questioned in person as much as their data can be, we might be facing research fatigue across the general population. But it would still be good to know when, how and why in my opinion. Rather than relying on a feeling. Still, you can take sayings too far. After all, the Romans also believed anybody could be a doctor. And I don’t want to start a fight. Blog: We are with you, robots. Patient Intelligence has often been branded dangerous too.